Mr Mitchell told he's "toast"
Andrew Mitchell denies calling officer a pleb "I did not, never have, never would"
The Government's Chief Whip Andrew Mitchell MP for Sutton Coldfield strongly denied calling a Downing Street officer a pleb in his resignation letter to David Cameron. "I did not, never have and never would call a police officer a "pleb" or a "moron" or use any of the other pejorative descriptions attributed to me. "The offending comments and the reason for my apology to the police was my parting remark "I thought you guys were supposed to f**king help us". The Government's Chief Whip Andrew Mitchell MP handed his resignation letter to the Prime Minister today. "I thought you guys were supposed to f**king help us" I was "obviously wrong". But Mitchell does admit he said to police: I thought you guys were supposed to f***ing help us. The Prime Minister has accepted the resignation of Chief Whip Andrew Mitchell. Further reaction can be found on ITV News. Sorry to hear Andrew Mitchell has resigned; was the right thing to do. Andrew Mitchell MP for Sutton Coldfield has resigned as Chief Whip after an ongoing row over a Downing Street police officer. No 10 Downing Street has confirmed. 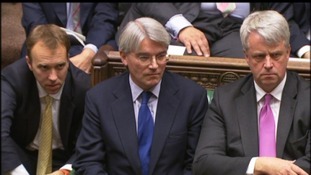 Sky News is reporting that Chief Whip Andrew Mitchell has resigned. Tory Party Vice Chairman Michael Fabricant said Andrew Mitchell has "re-ignited" the row over whether he swore at police by apparently denying it in the House of Commons today. Several MPs have confirmed to me that AM did indeed say #pmqs "I didn't swear" (at the police). This puts a whole new light on the issue. Oh dear. Labour were never going to let the story go away, but now he has managed to re-ignite it himself. Self-ignition? Ed Miliband called for Tory Chief Whip Andrew Mitchell to clarify what he said to police officers during his altercation outside the gates of Downing Street a few weeks ago in the House of Commons today. During the exchange between the Labour leader and the Prime Minister Mr Mitchell appeared to deny having sworn at police, shaking his head and apparently mouthing "I didn't, I didn't" as Mr Miliband said that people who swear at police should be arrested. In response, the Labour leader said: "He says from a sedentary position he didn't. Maybe he will tell us what he actually did say." A senior Labour source later said that Mr Mitchell's apparent denial made it all the more essential for it to be made clear exactly what he did say.